Truffles have been enjoyed as a gastronomic treat for millennia but it is only in the last hundred years or so that they have been universally recognised as a fungus, a mushroom. Some thirty species of truffle are thought to exist but here at Le Gardian we are intending to raise just one – The Black Diamond (Tuber melanosporum) or Périgord truffle. Truffles multiply by spores and observation of these under a microscope is the only absolutely certain way, short of DNA analysis, to distinguish one species from another. The black truffle or rabasse grows in a strange symbiotic relationship with the roots of several trees but oaks are the most productive, particularly the evergreen Holm Oak (Quercus ilex) and the deciduous Downy Oak (Quercus pubescens). 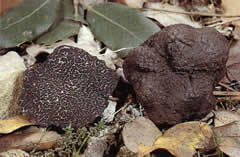 The truffle enables the tree to assimilate phosphorus and in return it receives sugars to enable it to grow. It does this by producing mycorrhiza (tiny 2 to 3mm swellings the colour and shape of a miniature date) which invade the tree roots. The truffle develops over many months and harvesting can begin as early as 15th November although tradition has it that the best truffles are to be found between mid January and mid February. Over the last hundred or so years the French truffle harvest has fallen from around 2,000 tonnes to 20 tonnes and the price has risen accordingly. Over the last three seasons the wholesale price has hovered around €700 per kilo with retail prices in Paris, New York and London more than twice that. 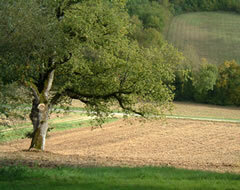 “At last, a branch of agriculture in which there is no problem of surpluses” – French Minister of Agriculture in 1988. An excellent site to learn more about truffles is www.sainte-alvere.com which gives recipes, news about truffles and, in season, current market prices. A recent book, which is a perfect introduction to the world of truffles, is Elisabeth Luard's Truffles. To buy a copy at a bargain price click here.